"Amboy” is a term I haven’t heard in a long time. That’s what my family called male cousins who were born and grew up in the United States. It was short for “American boy”—though not regarded as American in their adopted country, or Filipino when they visited the home country. I thought that moniker was no longer used. But Amboy was how the Filipino-American chefs and restaurant managers visiting from Los Angeles, Chicago and New York called themselves. The Amboys were on a 10-day culinary tour of Manila on the invitation by the Consulate in Los Angeles and organized by Clang Garcia of Jeepney Tours. They visited markets, restaurants, Chinatown, a lechonan in Metro Manila, and even reached Pampanga, Cavite, Batangas, Quezon and Subic, the latter for their lessons on Aeta jungle cooking. They were impressed with Jordy Navarra’s Toyo Eatery, and though they didn’t say exactly why, the language of smacking lips spoke of truly Filipino flavors of dishes not done the traditional way. That’s what these chefs aspire for and are achieving, in fact, judging from the glowing write-ups about them in blogs and newspapers like the Los Angeles Times. We met at Provenciano Restaurant on Maginhawa Street in Quezon City, where chef Chris de Jesus was asked to do Visayan dishes because the group wasn’t going to the middle provinces. A few days after, the farewell dinner was at Top of the Citi by Chef Jessie in Makati, where chef Datu Shariff Pendatun III was serving Moro cuisine cooked with coconut. 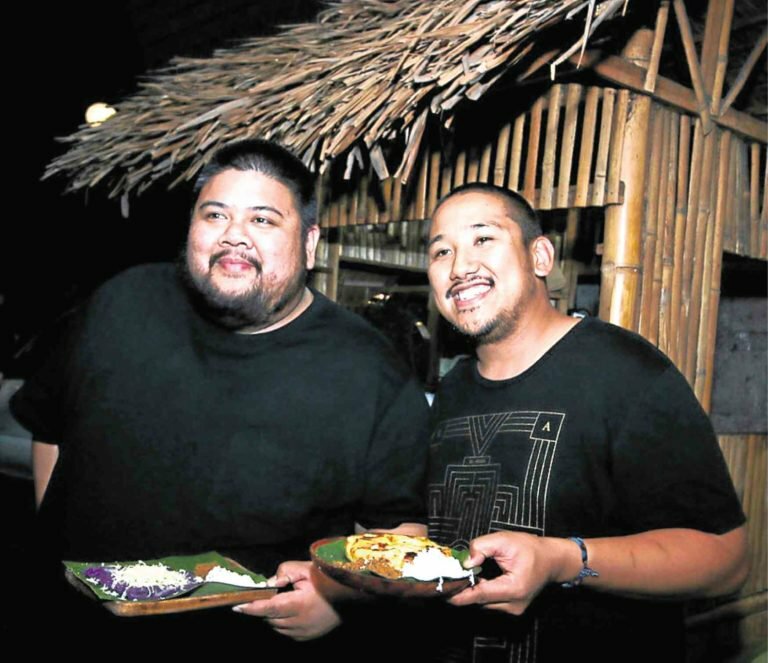 It was a quick tour of the country’s cuisine, but the experience gave the Amboys a glimpse of how varied Filipino cooking is, especially since many of the chefs have experienced only their family’s regional dishes. Johneric and Christine Concordia described their barbecue place, The Park’s Finest BBQ, as “American cuts… with a Filipino flavor.” The couple and the others are often questioned about their Filipino food’s authenticity, which I took to mean in terms of flavor, procedure and cut. Writer Felice Sta. Maria, who with Nana Ozaeta and myself were there to answer their queries, gave them the answer: Food evolves. But Sta. Maria also reminded them that while our food works in the street and out of food trucks or small eateries, it can also be elegant. Most of the chefs started and apprenticed with other countries’ cuisines. 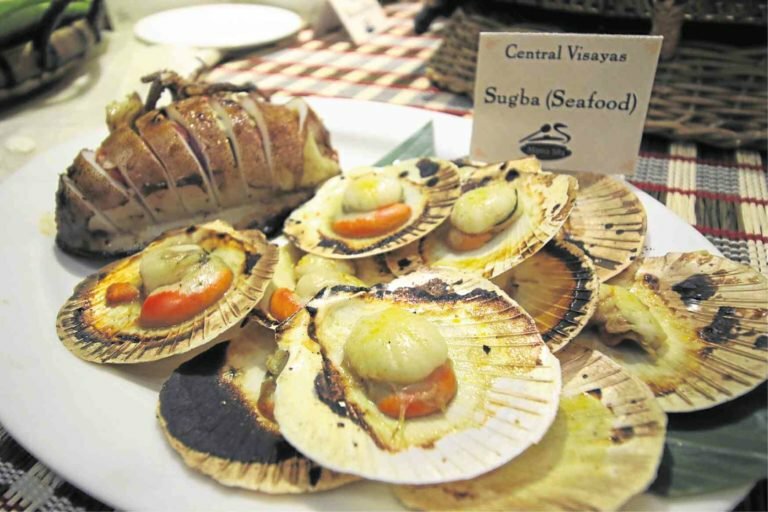 Now they have returned to home cooking—the family and barkada favorites. Those who follow the Filipino food scene in the United States will be familiar with Alvin Cailan, who started with a food truck he named Eggslut which offered variations on eggs with Filipino flavor touches. He also had Amboy, which closed and has reopened in New York. He said all the chefs with him want to present Filipino culture in food better than Anthony Bourdain. And Cailan does have the wherewithal to do that, having been trained by the best chefs in America, coupled with his love for cooking, understanding and eating Filipino food. Chad Valencia started, with his brother Chase, a pop-up that became a regular restaurant called Lasa. Asked why a food critic loved his pancit, he discussed what went into his canton mix, giving us an idea of its Filipino touch with patis and calamansi flavors, along with modern riffs such as scallions and patis-cured egg shavings. RiceBar is Rick Olalia’s version of the “silog.” As described by the Los Angeles Times, his space is just enough for a small counter where the chef works face-to-face with his customers. What makes his dishes distinct is Filipino heritage rice. Like any feasting, we tend to overwhelm guests with lots of items, just like the Provenciano menu hosted by Mama Sita Foundation. Food from “the happy islands,” as Sta. Maria called the Visayas, had starters of okoy, lumpiang sariwa and bam-i, followed by the mains of lechon, laswa, humba, chicken inasal, kadios-baboy-langka, sinugbang lamang dagat and kilawing puso ng saging. Capping the dinner were three kinds of desserts, then delicacies of cookies and rice cakes. At the dinner featuring Muslim Mindanao cooking, a kulintang artist provided background music. Chef Pendatun added a touch of aroma by burning incense. Three tribes were represented by the dishes: Tausug Pyanggang (chicken cooked in burnt coconut) and Piayalam (white pompano in lemon grass); Maranao’s Urang Piyarem (crawfish with coconut meat sauteed in turmeric and chili) and Inaluban a Haruan (snake head in coconut milk and sweet potato leaves); and the Maguindanaon Lininggil a Kambing (goat with roasted coconut) and Sangkerat (saba plantain in coconut cream). So, even if the Amboys didn’t get to see the central and southern parts of the Philippines, they were able to travel through their taste buds. But, apart from the variety of our cuisine, it is that sense of happiness and friendship that also defines our culinary culture. For the Fil-Am chefs, I suppose it is that “rejoicing” they were able to experience that they would want to transmit the most through the food in their eateries. That would make their offerings “authentic Filipino” in my book.